The schedule just didn’t quite work. A little too late a start from Milwaukee, a couple of wrong turns on secondary roads and not enough caffeine meant that I didn’t cover the too-many miles necessary to get to Omaha for an early Storm Chasers game. That was the only option since there was only one professional baseball game in the entire state of Iowa on Sunday and it was another early one in Sioux City, which is a bit out of the way. So we’ll just see what tomorrow brings. The drive west from Milwaukee through Madison and southwest to Dubuque goes through rolling farm land that, this time of year, is very picturesque. Did I mention corn? 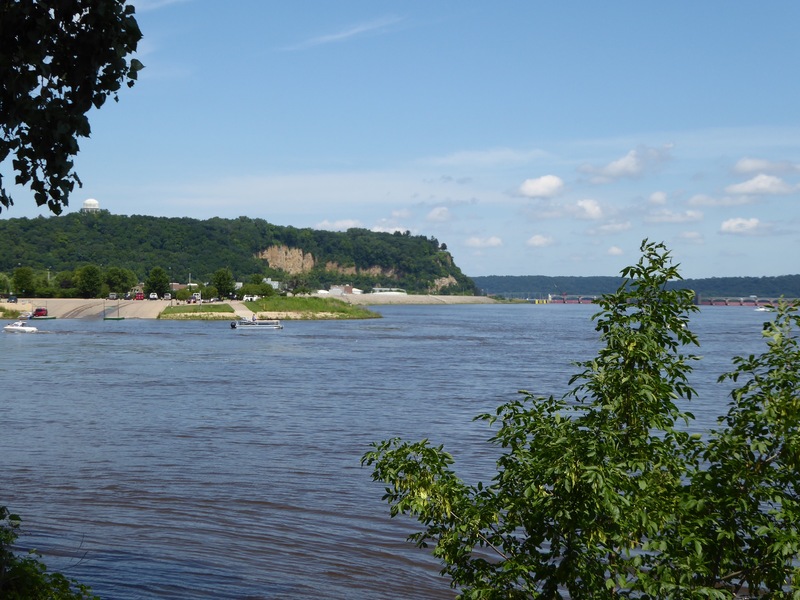 Crossing the mighty Mississippi at Dubuque, the land begins to flatten out a bit, but the farming continues unabated. OK, back to baseball. Just a word on dugouts. 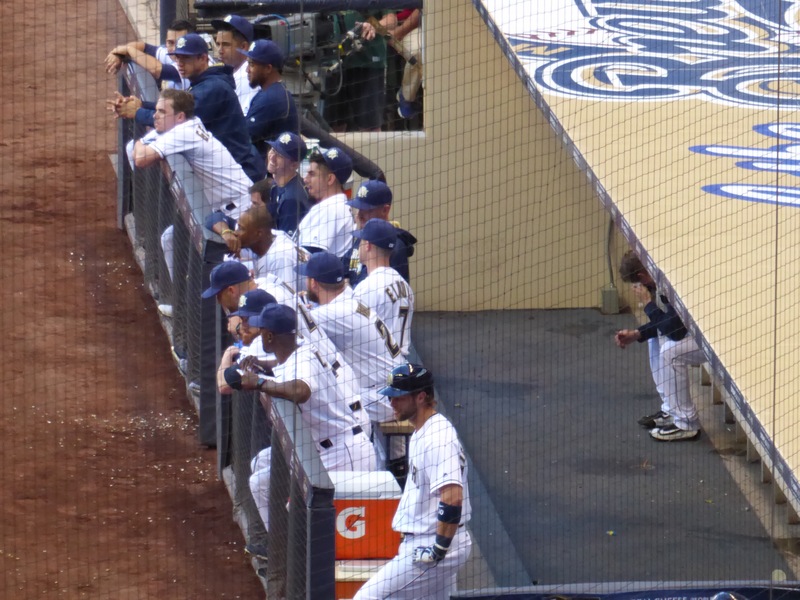 Look at the pictures of the near-cellar Brewers and of the first place Tigers in their respective dugouts. Who looks more excited, more into the game, more supportive of their teammates? 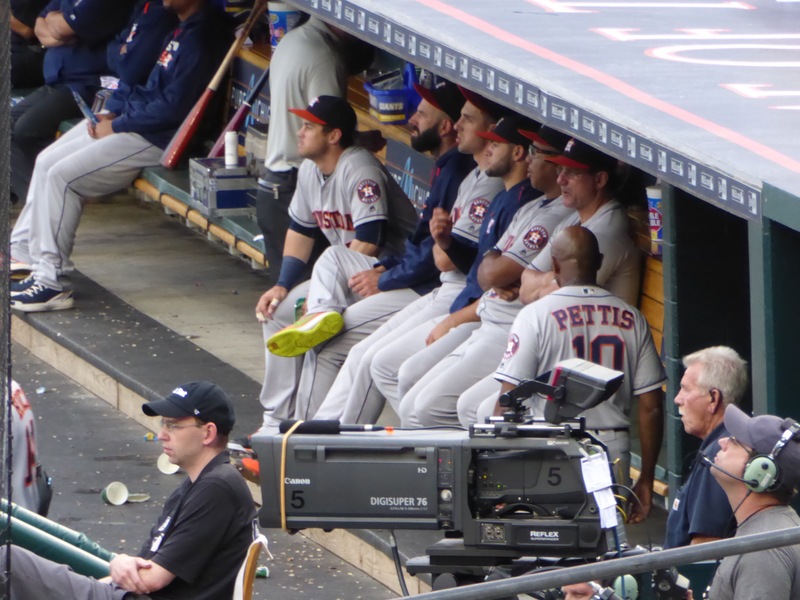 The position and posture of the players in the dugout doesn’t seem to correlate with division standings. And another thing. I always thought the home team occupied the first base dugout and the visitors were relegated to the the third base side. Apparently not. When we first noticed a home team on the third base side, we looked into it and found that, while it used to be that teams east of the Mississippi (see above) were on the first base side and those in the west on the third base side. Not true any longer. In an almost but not quite even split, 13 big league teams have the third base dugout at home and 17 use the first base dugout. You worked in Henry Kane’s “And another thing.” Nice! Your links have been enlightening and lead to other links, for an ADD guy like me. I went to your Bo Jackson running up the wall, which was stupendous and reminded me of Donald O’Connor is some movie, and stayed for a youtube of nutty stuff Jose Altuve has done. Re dugouts, he is shown carefully stacking and unstacking columns of paper water cups. i guess the ‘Stros were winning.